Don spent a week there one night: 1991 Studio was a great set because the photographers often captured the person behind the player. Usually, this was a good thing for all involved parties. 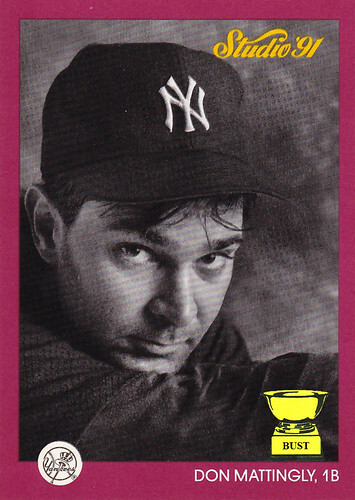 In Don Mattingly's case, this nearly landed him in rehab. Mattingly had arrived at Studio's studios after a four-day bender during which the only food he ate was tequila worms and the only shower he took was when he fell face first into a clogged urinal. He had subsisted on whiskey and what little charm he had left after subsisting on whiskey, and showed up at the studio a beaten and beleaguered man. The photographer did his best to clean him up, changing Mattingly out of his sombrero and poncho, trimming his puke-stained mustache and pulling the family of river rats out of his pants. Knowing it wouldn't be long before the Yankees first baseman was spread eagle on a bathroom floor, the photographer snapped one shot, seen above, a moment before Mattingly threw up all over the camera.